Authorities in Upper Bucks County are currently investigating two locations in Milford Township in relation to a series of mysterious explosions. One person is now under arrest. At least 20 loud booms have been heard in Bucks and Lehigh counties in the middle of the night dating back to April 2nd. Officials have been on the scene of a small chemical company at Spinnerstown and Steinberg roads in Spinnerstown since 6 a.m. Thursday, 6/28. They are also at a home at Old Bethlehem Pike and Brick Tavern Road in Quakertown. A man who works at the chemical company lives at that home. The Bucks County District Attorney's Office, Bucks County Detectives, Pennsylvania State Police, the FBI and the ATF are investigating. The ATF performed controlled explosions at the residence today. 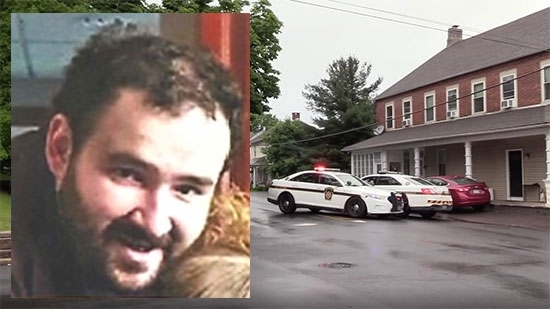 Bucks County District Attorney Matt Weintraub announced the arrest of 30-year-old David Surman Jr. He is the owner of the chemical company that was searched today. Officials say he took chemicals from the business and used them to make explosives. He is charged with with weapons of mass destruction among other charges including possession of an instrument of crime, possession of an offensive weapon, recklessly endangering another person, possession of a controlled substance (meth), and possession of paraphernalia. A large bomb capable of mass destruction along with other smaller explosives were uncovered in Weintraub's home. Chemicals used in the bomb making were also discovered. Investigators recovered several notebooks with illustrations and notes that may give authorities an idea on his motivations. All of the material has been sent to the FBI labs. It will be compared to material collected at the sites of previous explosions as investigators try to link him to the late night explosions. The Mercer County Prosecutor's Office has released police body cam footage from the shooting at Trenton arts festival. It happened in the early morning hours of June 17th at the 12th annual Arts All Night festival held at the Roebling Wire Works Building. The video starts as police were trying to shut down the event and clear the area due to several disturbances and fights. That's when gun shots rang out. The scene quickly became chaotic. Officers had to sort through the crowd of 1,000. The video shows officers dealing with the injured, unruly, and searching for suspects. 22 people were injured, 17 from gun shots. One suspect was shot and killed by police, two others have been charged. Authorities say that the violence stemmed from a gang dispute. A Pennsylvania man has been sentenced to 7-14 years in prison for spraying painting swastikas and other racist graffiti around Chester County. 25-year-old George Rissell was convicted of ethnic intimidation and criminal mischief. The prosecution had only recommended 5-11 years. Judge Patrick Carmody told Rissel that "being drunk" "doesn't excuse being racist." Rissell apologized, "I absolutely hate this crime I've committed. It's the dumbest thing I've ever done." 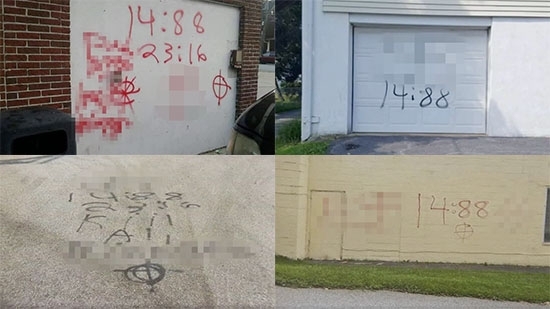 He spray painted the messages on walls, garages, pavement, and vehicles in Coatesville and neighboring townships last August (see photos below). Rissel claims he is not racist but was indoctrinated by white supremacists during past prison stays.